Almost 60 years ago my mother, Loella Armstrong, moved from Empire, Oregon, to the University of Oregon with three young daughters and a dog. It was August of 1955, and as a 28-year-old single parent, she rented a university-owned house at 1385 Franklin Boulevard and opened it as a rooming house for university students. Women were allowed to live there with mom serving as their chaperone. Most were from Asia and the Pacific Rim. Experiences there led to our family’s awareness of many cultures. That’s what a university experience can do when it brings together people from all over the globe. At home in the big white house, mom taught the international students to cook, filling the house with fragrant smells of Asian ingredients not found in Eugene at the time. The students adopted the three of us as little sisters. Two young women from Nepal, for instance, dressed us in saris and bright jewelry. During vacations, when the dorms were closed, more students brought blankets to sleep on the living room floor. Some brought guitars and everyone brought a little bit of their homes into ours. Our family particularly enjoyed sharing American traditions during the holidays. Mom always decorated a big Christmas tree and baked holiday cookies, and my sisters and I loved sitting on the stairs while we listened to the grown-ups sing in many languages. We were supposed to be in bed, of course, but it was all so exciting and different. Mom entered the university as an art education student and later earned advanced degrees in special education and counseling. While she was studying, my sisters Sandra, Linda, and I attended Condon Elementary, where we learned French and Spanish. We romped around campus as we took swimming and art classes and attended international programs and concerts. When we were little, mom always told us that we’d travel one day. That was hard to believe at a time when traveling by jet was only for the wealthy. After all, she was just a student with three children and no job. We finally began a life of traveling after she received her degree and got a job as a teacher on Guam. From there, we flew around Asia, and in 1966, around the world. Mom lived on Guam for most of her career. Prior to her death in 2001, she was inducted into the Guam Education Hall of Fame for her work launching the first special education program there. My sisters and I all pursued international interests as adults. I graduated from the UO in international development in 1970, and also received a master’s degree in teaching English as a second language from Seattle University in 2000. My older sister Sandra (Kickbusch) attended the University of Guam and became a Certified Travel Counselor. My younger sister Linda (Larsen) attended the UO and later earned an education degree and taught Danish as a second language in Copenhagen. 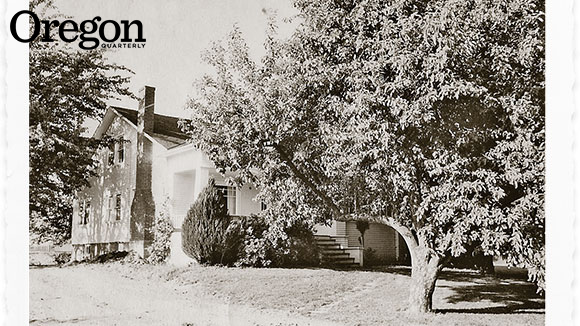 Our experiences at the UO, living in what is now called the Wilkinson House, really shaped our lives. After leaving Guam the first time, Mom was the first single parent to be hired full time in Europe by the United States Army Air Forces. She taught in Baumholder, Germany, while Linda was still in high school and I attended the UO. Linda has been living in Denmark for more than 40 years, while Sandra continues to advise travelers. I am presently coordinating art exhibits for my late husband’s artwork in Bastad, Sweden, as well as Soap Lake, Washington, and Palm Desert, California. I will also travel to Copenhagen, Paris, Spain, and Tristan da Cunha within the next year. The Wilkinson House became part of the art department when we moved out. The house was named after art instructor Jack Wilkinson, who died in 1974. Studios replaced the lawns and many of the trees have been removed, but the old house still looks like a homey place where creativity is nurtured for both American and international students. Merilee Armstrong Bengtsson ’70 studied international development at the UO. She lives in Mukilteo, Washington.